Come one, come all! Marvel at the curiosities, revel in the entertainment, indulge in the delights! There will be entertainment, live music, beer tent, stalls and a children's fair. Spanning from the Wishtower slopes to the Bandstand, this event aims to astound, dazzle, entertain and delight visitors of all ages. The evening of the Saturday will also host an adult only night’s entertainment; a masked ball venue to be confirmed, featuring music, dancing, burlesque and much more! Steampunk means many different things to many different people. To some, it is a fashion, style of dress, a persona. To others, it is art, craft, design, even a complete lifestyle. At its heart and in its beginnings Steampunk is a genre of science fiction, branching out of the Cyberpunk of the 1980s but set in a pseudo-Victorian style era instead of the stark futuristic future of Cyberpunk. Imagine a world where the Victorians were far more technologically advanced than they were in reality, steam-driven airships travel the skies, immaculately dressed adventurers and explorers armed with aether powered ray guns, clockwork horseless carriages transporting ladies and gentlemen around large gothic industrial cities, mechanical time machines. 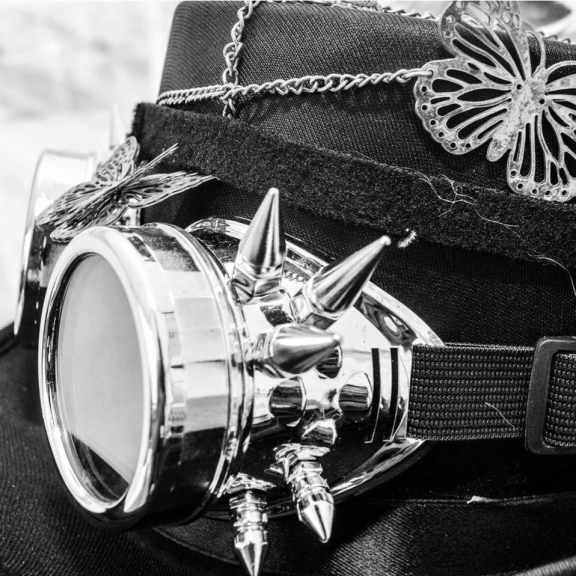 Steampunk comes in many different styles; for some, it’s all top hats, tailcoats, goggles and gears; for others, it’s pith helmets, khaki jackets, moustaches and steam-powered blunderbusses; for others still, it’s lab coats, gadgets, magnifying glasses and mad inventions! All these themes and personas blend seamlessly into a wild, wonderful, bizarre retro-futuristic world where the march of time and technology took a very different route to the one we know today.